Donna Cruz Yrastorza Larrazabal popularly known as Donna Cruz, is a singer and actress in the Philippines. Donna is is born in 1977 in Manila, Philippines and is the youngest child of Renato Yrastorza and Dolores Cruz Yrastorza (of the famous Cruz clan of singers in the Philippines). Donna has one sibling, Jomar Cruz Yrastorza also known as Jomar Cruz (who had a brief stint in Philippine showbusiness in the 90s). Donna grew up in Las Piñas City. 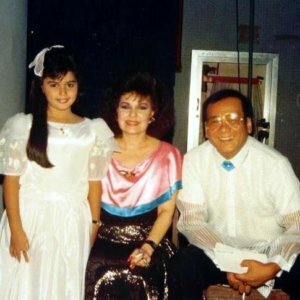 Her mom Yolly who comes from the Cruz family of singers in the Philippines has passed on her love for singing to Donna and at such a young age, Donna has been trained in singing. Donna started first as a ‘Bulilit Bagong Kampeon‘ contender, and then Champion, in 1988. ‘Bulilit Bagong Kampeon’ is a popular nationwide singing contest on TV for young kids in the Philippines. She was also chosen, together with Timothy Villegas of Ryan Cayabyab’s 14K, to represent the Philippines in the Mermaid International Children’s Song Festival in Hiroshima, Japan. Cruz and Villegas bested at least 8 other ASEAN representatives with their piece, “Yesterday’s Dream“, and emerged as the Grand Prix champion of the competition. 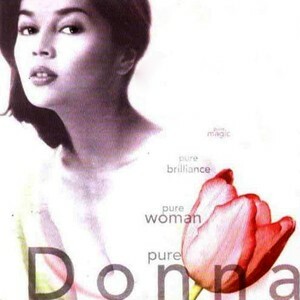 In 1989, Donna signed up with VIVA Records and launched her recording career. She debuted with self-titled album “Donna“, which garnered a triple-platinum award. Singles released from the said album are “Kapag Tumibok Ang Puso“. “Rain” and “Boy (I Love You)”. She won the Best New Recording Artist Award in the Awit Awards with this album. A year after launching her debut album, she released another LP entitled “Kurot Sa Puso“. It was also during this time that she was scheduled to complete in the BRASOV International Song Competition in ROMANIA. Although Donna did not manage to get some of the major awards in the competition, she has the distinct honor of being the youngest singer contestant amidst 20, 30, and 40-year old competitors. Meanwhile VIVA films, the movie counterpart of VIVA Records has been exploring Donna’s potential in acting and asked her to try and enter the nitty-gritty world of showbusiness. She and co-star Tony Lambino (of Ryan Cayabyab’s 14K) were introduced into the world of movies by playing a minor part in the 1991 movie version of the popular Filipino superheroine “Darna” (→ Wikipedia: Darna), and this movie was followed by several comedy flicks. 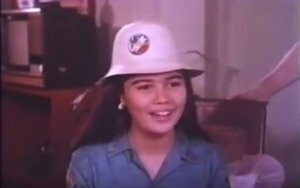 After a short stint in Darna, Donna continued to play minor roles in movies, mostly comedy flicks with comedian-singer Andrew E. and Janno Gibbs (which are popular around that time). She also is a regular in the Alabang Girls TV show from 1992 to 1994. Donna also joined the now defunct TV show “That’s Entertainment“, a daily afternoon variety show showcasing teen talents in the Philippines. She is a part of the Tuesday Group (the talents that appear on the show every Tuesday).This show is spearheaded by the respected German Moreno, a well-known veteran TV show host in the Philippines, who also is a great discoverer of talent in showbusiness. After 2 years since “Kurot Sa Puso” (her second full LP album), Donna released her third solo album entitled, “Langit Na Naman” (yes it is a revival of the original song from the Hotdog’s which was a popular 70s band in the Philippines) in 1994. “Langit Na Naman” received a Gold Award. At age 17, VIVA Films finally decided to make Donna the movie actress that she ought to be. In 1994, Donna made two drama movies, “Kadenang Bulaklak” where she co-starred with then famous young actresses Vina Morales and Ana Roces. Donna also starred in another drama during the same year – “Pangako Ng Kahapon“, where she co-starred with no less than popular actors during that time: Agot Isidro, Alice Dixon, and Gary Estrada. This movie gave Donna Cruz her first ever Best Supporting Actress award nomination in the local movie awards, quite a feat for someone her age at that time. Donna’s onscreen ‘loveteam’ tandem with Ian De Leon was also introduced in this movie. In the same year, 1994, Donna got her own daily soap opera entitled “Villa Quintana“, aired over local Philippine TV network GMA-7, where she and fellow actor Keempee De Leon act as star-crossed lovers whose families are at war against each other. Donna played “Lynette”, a very rich but equally very nice girl who fell in love with “Isagani” (played by Keempee De Leon), a son of a poor farmer in their village. The telenovela ran for over 2 years reaching double digit ratings – from November 1994 until January 1997. Donna’s popularity at this point reached the “household name” status. Being a popular actress, singer, and a pretty lady with a very wholesome social image and status, Donna Cruz became a favorite choice for product endorsements. 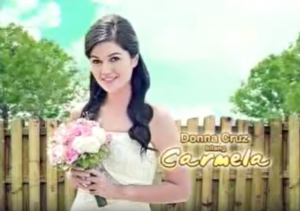 She officially became a ‘Camay Girl’ endorsing Camay soap [watch Donna’s Camay TVC here]. Donna was chosen as the official Lux (the shampoo brand) girl — a product endorsement given only to selected beautiful and prestigious women in each of their respective countries. She also did TV commercials for Whisper and Jollibee, and became U2‘s (a fashion brand in the Philippines) image model. Later that year, Sari-Sari, a popular clothing store in the Philippines, got Donna to be one of their celebrity models. As 1995 opened, she starred in “Campus Girls“, a youth-oriented movie together with Vina Morales, Geneva Cruz, and Donita Rose. Ian de Leon, Gary Estrada, and Lander Vera-Perez were also in this movie. 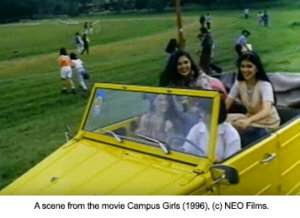 It was mostly shot in the vast beautiful campus of the University of the Philippines in Los Baños. This was followed later on that year with several feel-good movie flicks and romantic comedy movies for Donna. 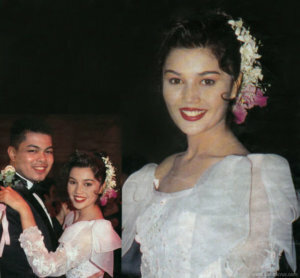 Come Valentines day of 1995, Donna turned 18, with a grand debut birthday celebration held at the Shangri-La Hotel in EDSA. It was one of the biggest “debut” birthday celebrations that happened that year, and it was of course, star-studded. Later on a TV special dubbed “First Blush”, Donna’s 18th birthday musical TV special has been released. It is an artistic compilation of recorded musical performances of Donna with popular Philippine singers and actors of the time, shown nationwide. This TV special is noted as being the only first of its kind on Philippine Television and so far during that time. 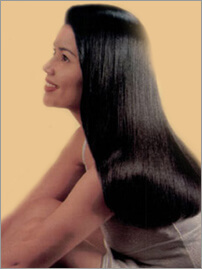 In October of 1995, Donna launched her 4th full solo and biggest-selling album ever, “Habang May Buhay“, an album composed of originals and a few selected movie theme songs. This album garnered a quadruple-PLATINUM award in the local music industry, an honor received by only a selected number of female recording artists in the Philippines. A little later on, the Donna Cruz – Ian De Leon loveteam was launched via the certified box-office hit, “Habang May Buhay (the movie)“. At this point, no other pair could be better than the country’s hottest young female star and Ian De Leon, the son of the country’s most famous actress Nora Aunor. To give a little more competition and spice to Donna and Ian’s onscreen love tandem, Keempee De Leon again got into the picture (the Donna-Keempee onscreen love tandem started way back in 1994 with Villa Quintana the TV series), by co-starring with Donna in 2 more movies, “Lovenotes the Movie“, and “Okay Si Ma’am“. The Ian-Donna-Keempee menagetrois reached its peak when Donna started filming with Ian De Leon again, and this time with no less than Philippine superstar Nora Aunor, in the Metro Manila Film Festival entry movie, “Muling Umawit Ang Puso“. In this movie, Donna Cruz won the Best Supporting Actress award. In February of 1996, Donna played as “twins” (yes, Donna played 2 characters) in the movie “Dahil Tanging Ikaw” where she’s paired with new teen idol Jao Mapa and again with Ian De Leon. 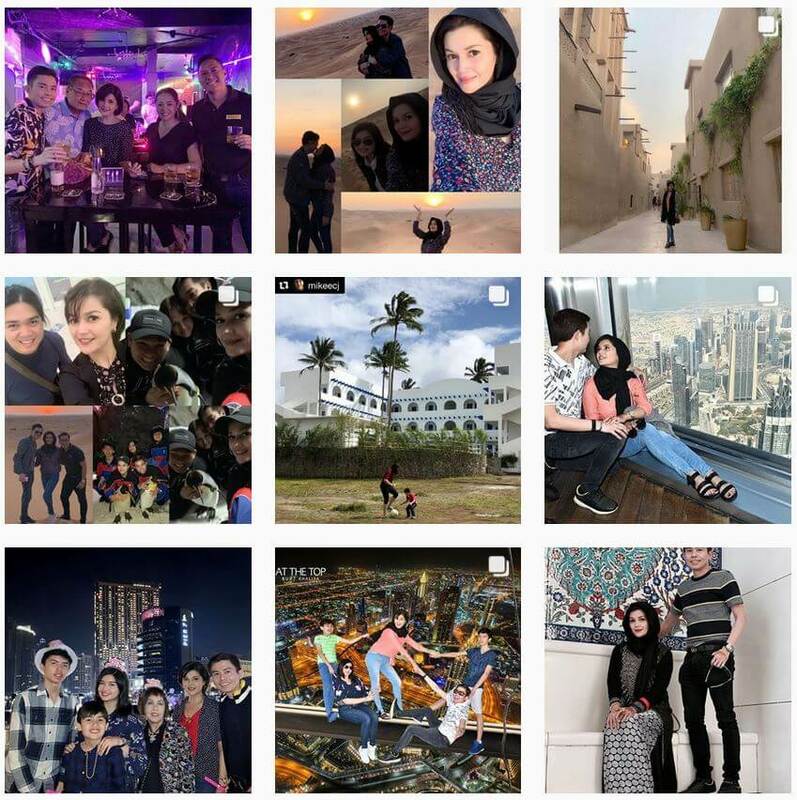 Four months after, she once again made a movie co-starring with no less than the “Prince of Philippine Action Movies” (turned Senator) Bong Revilla Jr., in a movie entitled “Pag-Ibig Ko Sa Iyo’y Totoo“. 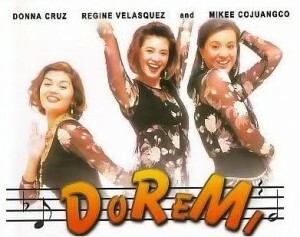 In November 1996, she did a comedy movie together with Asia’s songbird Regine Velasquez and the charming star Mikee Cojuangco in a movie entitled “Do Re Mi“. Donna, Regine, and Mikee are at their best comedy act ever in this movie. A lot of fans loved this movie, and were demanding for a remake many many years later. Truly the trio “Do-Re-Mi” have forever found a place in their fans’ hearts. Come Christmas of 1996, she released her first ever Christmas Album entitled “Merry Christmas … Donna“. Donna personally picked some of the songs in this Christmas Album. 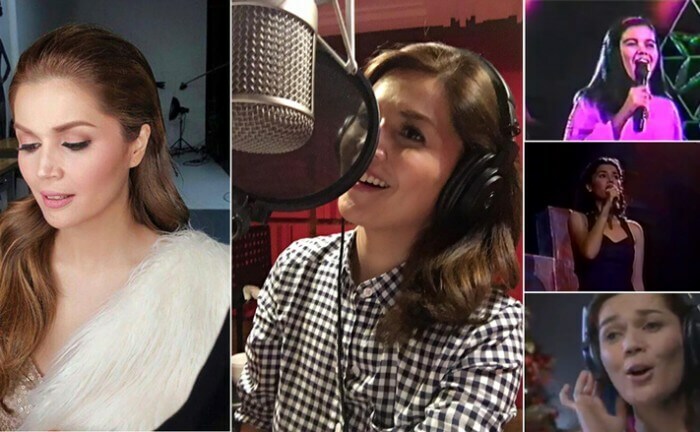 Donna Cruz recorded an Alan Menken (composer of famous Disney movie theme songs such as “Under the Sea“) song entitled “The Story of My Life” which is included in the Philippine release of the “Best of Disney Love Songs” album. At this point, the press is speculating that Viva Records is prepping Donna for the international market. 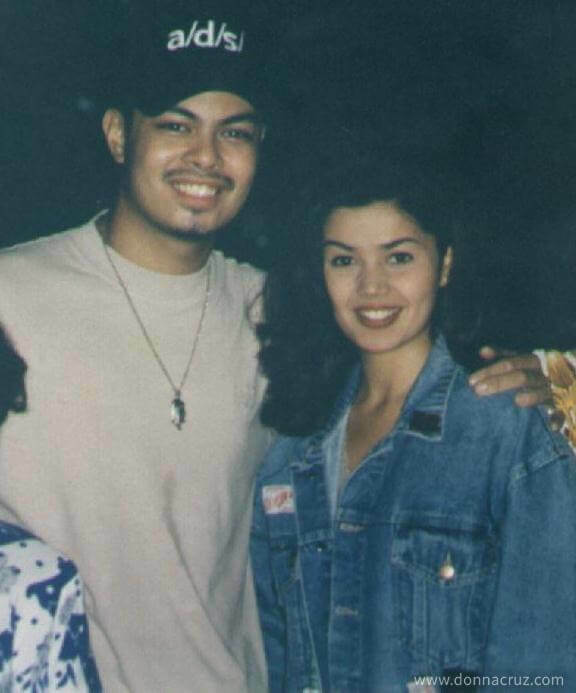 Donna filmed her last movie on June of 1997, entitled “Isang Tanong Isang Sagot” where she’s paired with American singer Jason Everly (→ JasonEverly.com), son of Phil Everly of the famous Everly Brothers. Earlier that year, Donna also recorded a duet with Jason, a song entitled “WISH”, which was included in Jason Everly’s first international album entitled “No Ordinary Music” and also included in Donna’s “Pure Donna” album. After doing a lot of movies, duets, and guest appearances, its time for another album again. This time, Donna released an album, “Pure Donna“, which turned platinum a week after it was released. This album was launched via the national TV musical special entitled, “Pure Donna” (too). 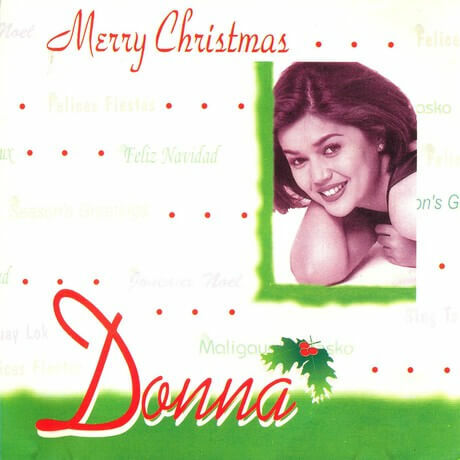 In December of 1997, she had her Christmas TV special shown nationwide, also named after her Christmas Album from the previous year, “Merry Christmas … Donna“. With all the successes of Donna’s solo albums, Viva Records deemed it timely to release a “best of” kind of album for Donna. So it happened in 1998, “The Best Of Donna” album was released. This album contains most popular tracks from her previous albums. 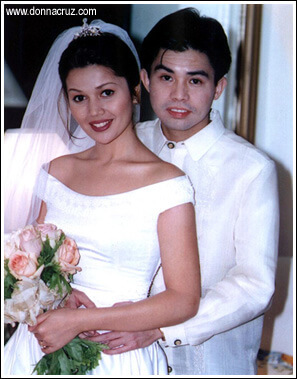 In February of 1998, Donna got engaged to an opthalmologist from Cebu, Dr. Potenciano “Yong” Larrazabal III. Donna and Yong met in 1997 via an introduction from a mutual friend. Since then, Yong and Donna have not stopped seeing each other. At the peak of her career, Donna and Yong got married at the Basilica de San Sebastian Church in Manila in September of 1998 only after a short engagement of less than a year. Donna is dubbed as one of the rare “virgin brides” in Philippine showbusiness (and we need not explain this more). After the wedding Donna moved to Cebu City to live with her husband. As she has told everyone she will stop being in show business for a long while and focus on her marriage life, to her fans’ disappointment. Donna tried her very best as and did well learning the Cebuano language a bit and adapting to her new life in Cebu where she and Yong started to raise their own family. Donna stayed out of the limelight for almost a year, until she has started recording another album again in July of 1999 entitled “Hulog Ng Langit“, while pregnant with daughter Ysabella. This is a one-of-a-kind album filled with so much motherly love and emotions which were the basis of the song selections. The album was released September of 1999. One month after the album was released, Donna gave birth to a very beautiful baby girl, Ysabella Adriana Larrazabal (nicknamed Belle). The onset of year 2000 paved way for many TV guestings, Mall shows and special appearances for the full album promotion of “Hulog Ng Langit”, which was eventually awarded a Gold Record (awarded in ASAP, ABS-CBN). After another year, a “Donna Cruz’s Greatest Hits” album was released early 2002. This album contains Donna’s best hits and a bonus Video CD containing MTVs of Donna’s famous singles. On August of 2003, Donna gave birth to a healthy baby boy, Cian. Her ultimate diet never fails to get her back to shape. Even with 2 kids, Donna looks super young and still is one of the most beautiful woman in the country today. 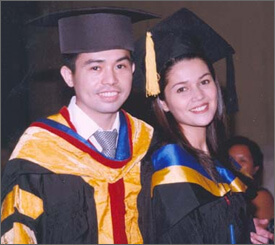 Despite being busy being a mom and doing several product endorsements, Donna successfully finished her Computer Science degree from Cebu Doctor’s College on October of 2003. At this point Donna busies herself in maintaining the website of her husband’s opthalmology group of clinics – Sight First Clinics, creating websites dedicated to poor and sick babies in Cebu needing donations (www.forbaby.tk), and keeping abreast with the latest internet technologies. We are so proud of you, Donna! On May 25th, 2007 Donna gave birth to another son. Named Inigo Renato Larrazabal, or Gio as he is fondly called, is Donna’s 3rd baby who’s named after Donna’s dad, Renato Yrastorza. After Gio has grown up a bit, Donna started loving marathons. Her husband Yong, a marathon fanatic having ran over 30 marathons worldwide have finally succeeded in getting Donna to start loving the sport. Donna participated in a few marathons as well as other related charity events surrounding it. Donna clocked 43 minutes for 5K in her first marathon (which was the Pink October run in 2008). She later on participated in many more including 10K, and 21K in both local and international ones too. On and off Donna was doing several rounds of product endorsements (Jollibee, Lactum, Pampers, and a few more), TV guestings (Donna appeared as a special guest in the mini TV series Daldalita and Bahay Mo Ba ‘To from GMA 7) and guest appearances on several variety shows, including Manny Many Prizes (hosted by no less than Manny Pacquiao himself – Donna and Yong’s very favorite in boxing). For almost 17 years “Donnanians” (how solid Donna Cruz fans call themselves) and speculators were wondering if Donna will ever record another album again, or go back to the movies, or even TV? Donna’s answer when asked before by interviewers and journalists “Music — most probably YES. Movies — most probably NO. TV? Perhaps — I will still have to talk it over with Yong”, she said. The fans’ cries are heard on November of 2015, Donna started recording a few tracks in Star Music’s studio. In January of 2016, Donna Cruz formally signs a recording contract with Star Music (an ABS-CBN subsidiary). A new album, dubbed “Now and Forever” has just been released March 2016.